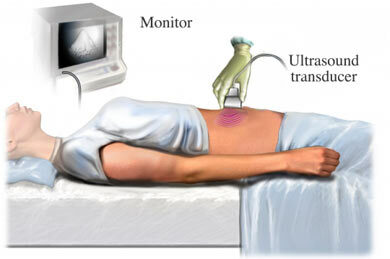 An ultrasound uses sound waves to create images of structures in the body. In most cases, there are no complications with this test. A physical exam may be done. Bodily fluids may also be tested. This can be done with blood or urine tests. Fast for 8-12 hours before the test. This will decrease the amount of gas in the intestines and make organs easier to see. Have a full bladder before the test. The doctor may advise drinking 6 or more glasses of water without going to the bathroom. You will be positioned on a table. A gel will be placed over the area that will be checked. The gel helps the sound waves travel from a wand to your body. The ultrasound machine has a hand-held wand. The wand is pushed against your skin where the gel has been applied. The wand sends sound waves into your body. The waves bounce off your internal organs and echo back to the wand. The computer can convert echoes into images on a screen. The images on the screen are examined by your doctor. A photograph of them may be taken. You may be asked to change positions or hold your breath during the exam. The gel will be cleaned off your abdomen. You will be able to leave after the test is done. You will be able to return to your normal activities. No. But, if you have a full bladder during the test, you may feel uncomfortable. A report will be given to your doctor. Based on the results, you and your doctor will talk about more tests or treatment options. After the test, call your doctor if the symptoms you had before the test become worse. ACR-SPR-SRU practice parameter for performing and interpreting diagnostic ultrasound examinations. American College of Radiology website. Available at: https://www.acr.org/-/media/ACR/Files/Practice-Parameters/us-perf-interpret.pdf. Updated 2017. General ultrasound. Radiology Info—Radiological Society of North America website. Available at: https://www.radiologyinfo.org/en/info.cfm?pg=genus. Updated March 9, 2018. Accessed April 3, 2018. Ultrasound—abdomen. Radiology Info—Radiological Society of North America website. Available at: http://www.radiologyinfo.org/en/info.cfm?pg=abdominus. Updated March 17, 20176. Accessed April 3, 2018.